home | Acid Test Chronicles | The Acid Test Chronicles - Page 21 - . . . This is a Newspaper Ad for the Cinema Theatre Acid Test. It is the only form of advertising known for this event. 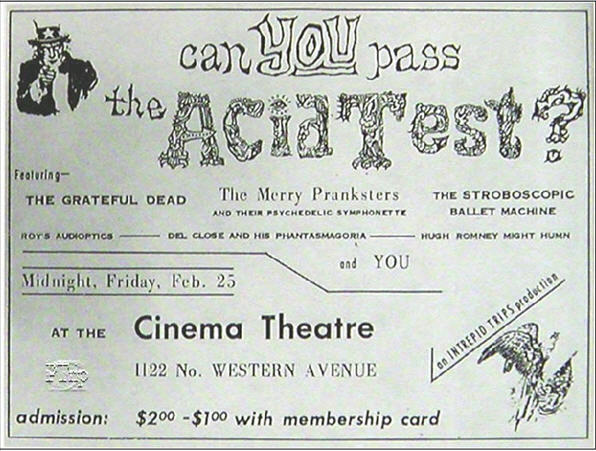 The Acid Test held at the Cinema Theatre on Feb. 25, 1966, would have been all but forgotten about, were it not for this advertisement shown above. No details at all are known about this Acid Test, other than those listed on the advertisement. This advertisement is a newspaper ad, not a handbill or poster. So far, it is the only form of advertising that has turned up for this Acid Test. Below, in the first few sentences, you can read where the photographer attended the Hollywood Test just prior to UCLA. That would be the Cinema Theatre Test (Feb 25) held on Western, I believe, since it was held just prior to UCLA (March 19), and after Watts (Feb. 12th), which is not mentioned here, in the excerpt, but Watts is mentioned in detail just prior to this. Another interesting note here is how Tom Wolfe completely skips over the Carthay Studios Test, which replaced UCLA on March 19, and also the Sunset Test, at the Harmonica Store on March 25, which featured Tiny Tim and Hugh Romney (at least that is what the poster announces) and the Grateful Dead played. It appears that Tom used information selectively, so one has to realize that when reading his material to look for "solid evidence" of something. Details that were not important for the book, were left out, of course, and this includes info on Tests that were not much to write about, to begin with, I would guess. "A team from Life Magazine turned up, led by a photographer, Larry Schiller, who was on to the LSD world and had taken the pictures at the Hollywood Test. They interviewed the Pranksters and took pictures and said they were going to do a big spread on the acid scene and, they hoped, put the Pranksters on the cover. So they hailed the bus on over to the big photo studio and Schiller convened them all. Then -- Babbs refused to go in. But the rest of them, Norman, Hagen, Cassady, a whole flock of them, went on it, and Schiller took a lot of pictures. To Norman it seemed square. For one thing, the guy was working in black and white, and the most obvious thing about the Pranksters was color, Day-Glo, the brighter the better, the more vibrations the better. Then Schiller had them all sit down in a group, against a black background, and in the middle they had Cassady stand up and wave his arms up and down like a crow. He took the pictures in strobe, and this would make Cassady look like he had multi-arms, like the great god Shiva. This strobe thing was at the time new in psychedelic photography, and the mass media would never tire of it. Recreates the acid experience, etc. Then Schiller told certain people to stay around for individual shots, colorful characters like Cassady and Paul Foster with his wild mutton chops and Importancy Coat, and Norman, maybe because he had a beard. The usual...The others went on outside where Babbs was. Finally, they all left. The ones who had stayed for the individual shots, and when they got outside, the bus was gone. Clean gone. Babbs, Mountain Girl, Zonker, Walker, and the others---split. Hagen couldn't believe it. "Why---we've been pranked!" he said. Things being like they were to begin with, the prank took on fundamental meaning. Those who got pranked finally made their way back to the smoldering San Souci, and Babbs & Co. had cleared out of there, too, taking all the money and the food. Babbs left word that they, the inner nucleus, were going off to hold a Test of their own and would rejoin the satellites for the UCLA Acid Test, scheduled for March 19. "The great idea still kept us together"--and Norman, Cassady, Hagen, Paul Foster, Roy Seburn, Marge and a couple others made a stab at preparing for the UCLA Test. But UCLA backed out of the deal because of the notoriety of the watts Test, and that did it. All began drifting off. It was a strange time and a strange feeling. Nobody could figure why Babbs had pranked Cassady; the others maybe---although that Hagen would get pranked was pretty strange, too--but Cassady--that was unbelievable.